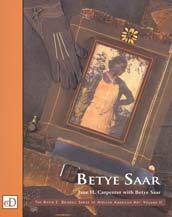 By Jane H. Carpenter with Betye Saar, foreword by David C. Driskell. This is the second volume in the David C. Driskell Series of African American Art published by Pomegranate Communications, Inc, 2003. Smythe-sewn hardcover bound book with cover: 8 ½ x 11 inches, 128 pages with 70 color plates.